Have you heard? The pilot video, Episode 1, and Episode 2 have been released! Do you have a favorite TV show? Remember how cool the first episode is? ← What color were Roxy’s foals? What would Jac produce? I have been thoroughly enjoying your blog… and I finally have found these videos!! We have our mare’s foal- and I was struck by the similarities. We still have Annie but she’s retired- and I miss her. Her foal Penny is coming up on a year old next month…these videos and your blog are going to be incredibly valuable to us all!! Thank you for doing this!!! I wish I could learn from you in person!! These videos are “the next best thing”. Thank you for sharing and your insights! I have the utmost respect for you Stacy…former trainer.boarding facility owner..and trail riding queen…..retired early because of breast cancer and following that I broke my neck…I regret that I am orderedby my doctors to never mount up again…hard to give up my love and passion for the horse but I can live it through you. GOD BLESS YOU STACY! i love watching all the videos hoping to learn something. 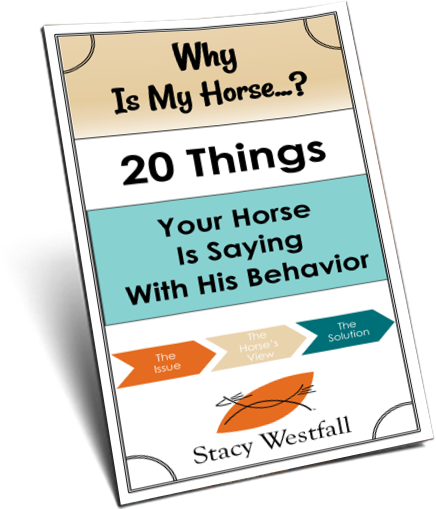 Stacy you are a great trainer i met you and Roxy art the Horse World expo pa a few years ago. Wow, I am so excited to watch this relationship progress! I’m excited about this. Mostly about the education I will receive. But about the healing it will bring to Stacy. I feel tears welling up. Feeling so much of what Stacy has gone through. This is a great idea! I love watching Stacy go through the process of training a new horse. I can’t wait for the following episodes to come out! I am hooked already! simple, loving, your love shines in this, and in your past congress posts! You are touching so many! God is Blessing you and He is using you to help so many! While he is being trained is what my IPad should have said, it has a mind of it’s own. I’m so glad you documented all this. 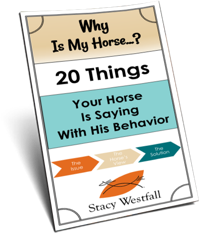 Great to know what you are thinking while he is ring trained.